California and Nevada are the home to many national and world champions who started out as beginners in our Junior Program—people like Rocky Carson, José Rojas, Janel Tisinger, Aubrey O’Brien, to name just a few. 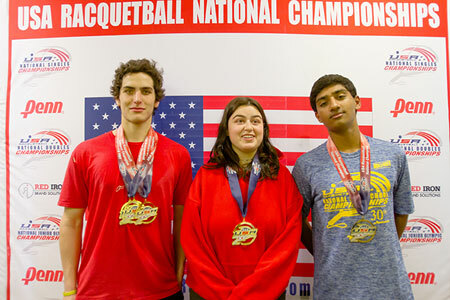 Our organization is committed to increasing junior participation in California and elevating racquetball to a sport where junior players can begin playing and continue playing for their entire lives. We have a dedicated Junior committee that meets monthly to foster the development and participation in racquetball. Our discussions and plans include options for the first time young player through the experienced national junior champions. We encourage your help, support, and participation, whether it is introducing racquetball to a junior, attending a tournament with your kids, or making a small donation, of which 100% helps fund California junior racquetball. With any money raised, we will help clubs form junior programs, and run junior events. We also hope to continue offering grants and monetary assistance to our junior players who compete in national and world events. Please take a moment to explore our site, and our junior links. Thanks you’re your interest in our racquetball junior players.